The Former Village Shop 120 years ago! Victorian photographer S.W.A.Newton, of Leicester, made a comprehensive photographic record of the construction of the Great Central Railway between 1896 and 1900. The railway has long gone but fortunately his photographic record remains. Travelling by train and bicycle he also visited and photographed street scenes in villages near to the new railway. The glass plate negatives he produced would have required a large camera and a sturdy tripod and the plates would have needed careful transportation back to his father’s photographic business in Leicester for processing. He produced almost 1000 photographs and the whole undertaking must have indeed been a labour of love! A high resolution digital scan of a second of these photographs, of the former Village Shop, Queen’s House and the School House has now been acquired and reveals the then scene in quite astonishing detail. From this scan it has been possible to make some very interesting enlargements of people and objects, which can be seen on the next page. The original full width photograph……. ….and a recent photograph showing how little the general form of the buildings has changed in 120 years. Photograph by S.W.A.Newton, reproduced by permission of Historic England Archive. Until well into the 1940s, motor car and motor cycle parts were sold from Wisteria Cottage by the Walton family. Could the proud man in the bowler possibly be either Mr Godfrey or Mr Walton? Queen’s House, pretty well much as it is today, other than the railings which would have been sacrificed to armaments during one of the world wars. Could the little girl have been bribed with an apple to keep still during the long time exposure necessary to make the picture? Is the lady with the bicycle perhaps a teacher? Could she really ride her bicycle in that outfit or is this another example of Newton’s careful posing of his subjects? The wonderful mural advertising Hook Norton Brewery’s celebrated ales and stout and on the gable end, Sunlight Soap, the outlines of which could be clearly seen until the wall was repointed a few years ago. 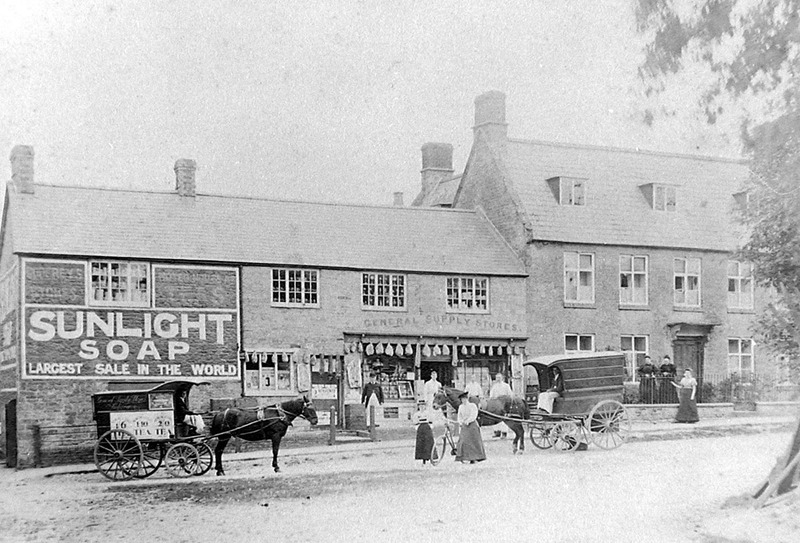 The origin of this photograph of the shop is unknown but it must have been taken at around the same time as that by Newton. Given the carefully posed products in and above the shop window and the two delivery vehicles it seems likely that it was commissioned by the owner. Which of the two pictures was taken first? In the one above, the sole proprietor is Mr Godfrey. If this was taken first, did Mr Walton become his partner? If it was taken second, did Mr Godfrey buy out his former partner, Mr Walton, or did the latter leave and set up a rival business in Wisteria Cottage. Did “Sunlight Soap” follow or precede “Hook Norton Ales and Stout”. If the former, did the then vicar perhaps have a hand in the change, “cleanliness being next to godliness” and all that. Answers on a postcard (or rather by email). Click here to see a larger version of the second picture. The dwarf wall with its bull nosed brick capping looks as if it needed a bit of attention in 1896. It’s amazing that it has survived for 120 years, given the countless times children have run along it since the removal of the railings! This entry was posted on Tuesday, March 14th, 2017 at 4:48 pm	and is filed under News. You can follow any responses to this entry through the RSS 2.0 feed. You can leave a response, or trackback from your own site.